This is a time consuming recipe but if you love Mexican food as we do it is well worth the effort, I also found I was able to take some shortcuts which worked really well. I only take shortcuts if as in this case I could not get the correct chillies for the sauce, this speeded up the recipe. The dish is full of complex flavours which make you think of the vibrant colours of Mexico, we had some left over which I simply added more cheese and reheated next day and it was still wonderful, the other thing I think is worth mentioning that the black olives which you use as a dressing really work very well and add yet another flavour to this exciting dish. Place chillies in medium bowl with boiling water; let stand 1 hour. Transfer chillies and soak in water to blender container process until smooth. Transfer puree to 2-quart (2-L) sauce pan; whisk in remaining ingredients. Heat over medium-high heat to boiling; reduce heat to very low. Simmer, covered stirring occasionally, 10 minutes. Heat lard in 10-inch (25-cm) frying pan or wok over medium-high heat until hot. Add the of beef and cook, turning frequently, until brown on all sides, 10 to 12 minutes; remove with slotted spoon to plate. Repeat with remaining beef. Do not be tempted to place it all in at once as rather than browning the beef it will steam it!
. Add onion to drippings in skillet; sauté over medium heat until soft, about 4 minutes. Return beef to pan, adding the stock, raisins, garlic, cloves, anise seeds and 60 mL of Red Chilli Sauce; mix well. Heat over medium-high heat to boiling; reduce heat to low. Simmer, covered, stirring occasionally, until beef is very tender this will take 1 to 2 hours. Using 2 forks pull beef into coarse shreds in skillet. Heat remaining Chilli Sauce in medium skillet over medium heat until hot; reduce heat to very low. Dip one tortilla in hot sauce just until limp, a few seconds; then remove, draining off excess sauce. Spread about 3 table-spoons (45 mL) beef mixture down centre of tortilla; roll up and place seam-side-down in 13 x 9 x 2-inch (33 x 23 x 5-cm) baking dish. Repeat with remaining tortillas and beef. Pour remaining sauce evenly over enchiladas. Sprinkle enchiladas evenly with cheese. Bake until cheese is melted and sauce is bubbly, about 25 minutes. 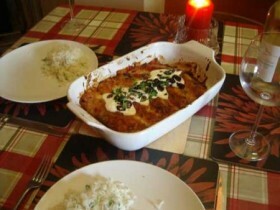 Just before serving, spoon the sour cream down centre of enchilada and garnish with olives and coriander.